40 Million Credit Cards — IV. A woman is on the phone. Woman: So you let anyone vandalize my credit card account? Voice from phone: Like Wikipedia, we assume good faith. 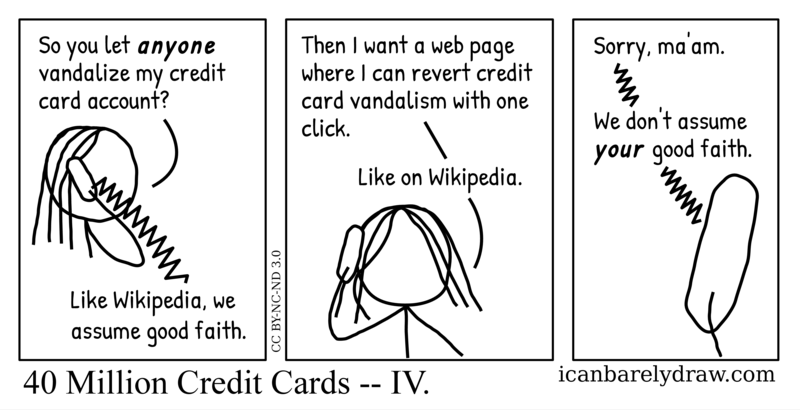 Woman: Then I want a web page where I can revert credit card vandalism with one click. Voice from phone: Sorry, ma'am. Voice from phone: We don't assume your good faith. Title: 40 Million Credit Cards -- IV.